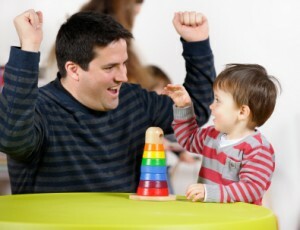 There are different ways on how your child can learn to talk. In the first 3 months of your baby, all he do it cry, sleep, eat and drink. But on the succeeding months, he will learn to open his mouth and follow a word you say. It is sometimes funny and stress relieving. However, there are times that it becomes annoying. Therefore, you will need help. 1. Find Someone Who Can Help your Baby Talk. With the help of some family members or perhaps your friends, you will have time to the chores that you need to do. When there is a person who can make your baby laugh, it will lessen your work However, do not forget to find time to your child, even if how busy you are in working on the household chores. 2. Observe How you Show Expressions to your Baby. There may be times that you are not in the mood to teach your child the appropriate way to speak and pronounce the words properly. This will sometimes make our child be frightened on the facial expressions that he sees. In order to adjust to this situation, try to think of everything g happy just to cover up your mad reaction and to avoid miscommunication on your child. 3. Always Support Your Child. Sometimes, it is very hard for the parents to let their child decide on what they will be going to do, but in the long run, you will not only benefit from it but also your child. Letting your child experience anything is a big plus especially when you are teaching him the basic things that he needs to know.